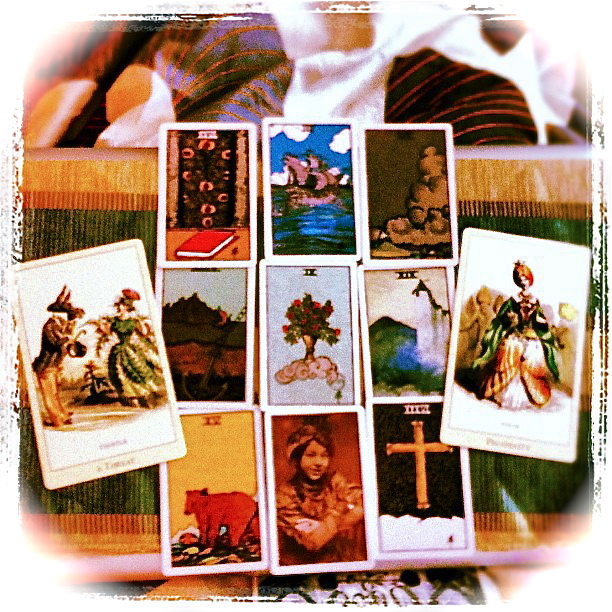 This morning I drew three cards from my Pixie Lenormand (1st ed. 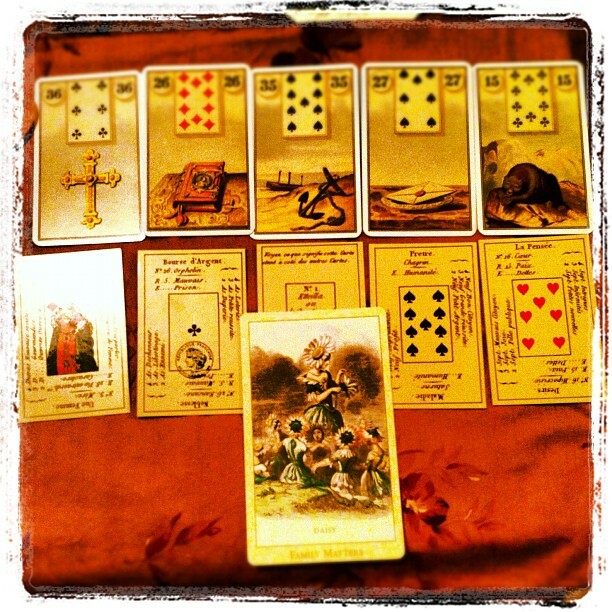 ), and supplemented it with same three cards from the Mystical Lenormand. I also drew one card from The Victorian Flower Oracle. Weather: Cloudy, with a chance of rain — 59 Degrees Fahrenheit. 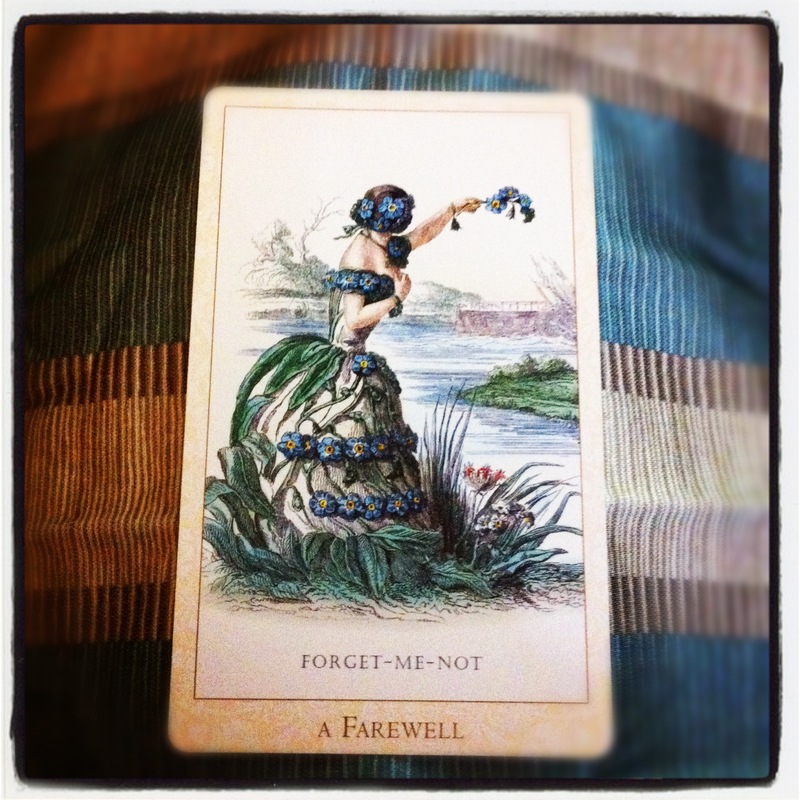 Forget-Me-Not / Farewell: Separation and farewells. Finishing a phase, and moving on. Communicating via phone and email with people who are far away. I feel that a lot of today’s energy will be spent on heavy, and possibly unfruitful, email and phone communications. Concepts like Inertial and feeling lonely, abandoned, stuck, and blocked are predominating. I am still feeling under the weather, and have a sore throat and a looming root canal. In addition, I am going to see my burn specialist, who is going to examine my recent surgery site. One of the items I need to purchase ASAP (and fight my medical insurance so they pay for it) is a very expensive and custom compression garment to keep my scars from raising and thickening. Wearing a compression garment feels in a way like being stuck in that Mountain energy. I feel that these cards could also relate to a specific clients I am going to read for today. Some of the energy did relate to my client, and the difficulties she’s going through. But the majority of the draw seems to be connected to the events of the day, or rather to the events that didn’t happen today. (1) Both my husband and I didn’t realize that my burn specialist appointment was scheduled quite early. When I saw the time my appointment is scheduled, I texted him but he didn’t receive my text in time. Eventually, I had to reschedule the appointment. (2) The person who was supposed to figure all the information relating to my compression garment ended up leaving me a voicemail saying she was very sorry but she still didn’t have all the needed information. And she’ll be in touch with me as soon as she knows more. (3) And, I finally ended up getting a dentist appointment, but only for next week. So there’s a delay there too. It seems that Mountain in today’s context represented largely a delay. Though things are going to fall into place (Anchor), it’s going to take longer than initially anticipated. Also, communication was blocked — my husband didn’t receive my text message in. And I ended up discussing the delay, in a way, via phone; i.e. rescheduling appointments, trying to get appointments, and listening to VMs. Truly, there’s a sense of inertia to today because I didn’t get to do as much as I hoped for, and I am “stuck” in the same place due to not accomplishing as much as I wanted. This one is a loaded one. I’m not really surprised. 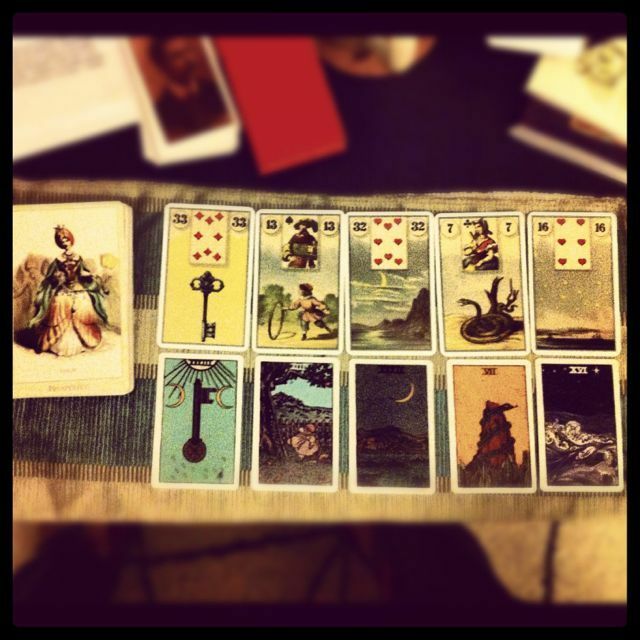 9 of Spades repeats in Lenormand, via the Anchor. I know what the Anchor + Letter + Bear means! The director of the school where I freelance just emailed me an offer letter regarding a full time position. Even though the transition from a consultant position to an employee status has been in the works for a few months now, this ‘letter’ has arrived today. And of course, it secures down my position — Anchor. I have a good idea what the Cross + Book stand for, but maybe I’ll talk about it later when I’m 100% sure and am comfortable bringing this up. This is why I LOVE Lenormand. 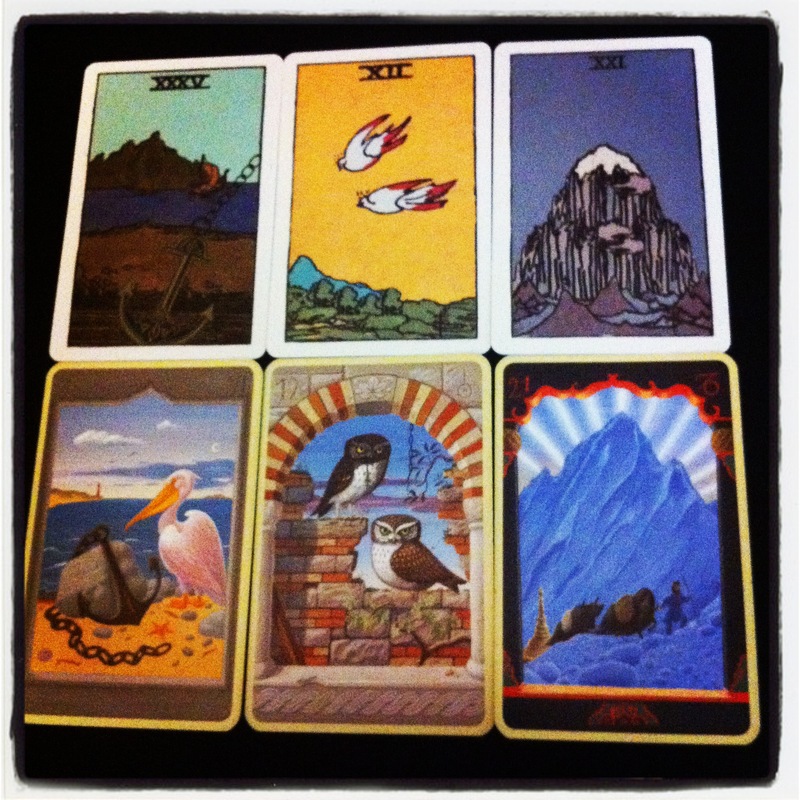 And this is a good example how it differs from tarot.